Dalisha Adams, a young mother from Brooklyn, has been arrested after she abandoned her two daughters aged just 3 and 5 on the street with only a few extra diapers. 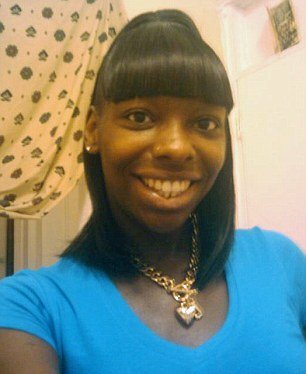 Dalisha Adams, a 26-year-old security officer, was picked up by police on Sunday night after leaving her children in the cold near housing projects in Brooklyn around 3:00 p.m.
Two women came across the two girls and stayed with them until police arrived. 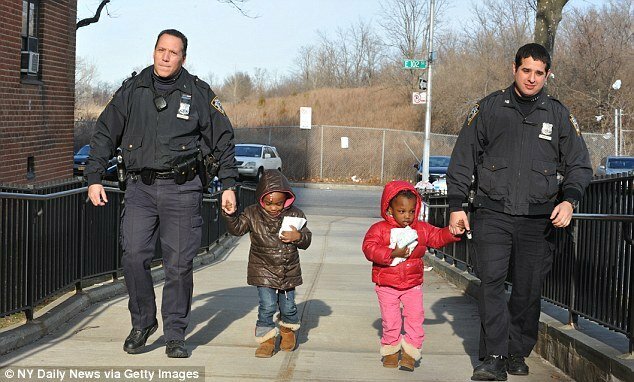 Though the two girls were bundled up warm wearing hooded down coats and Ugg boots, they seemed shaken up and very confused as to why they were abandoned near Bayview Housing Projects on Shore Parkway in Brooklyn, according to the New York Daily News. The Bay View Houses are about a mile-and-a-half from the Breukelen Houses, where Dalisha Adams lives with her daughters and their 8-year-old sister, Dinasty, from another relationship, who was with relatives when the incident happened. A neighbor of Dalisha Adams claims she often heard the mother screaming at her children. The woman, who did not want to be identified, told the New York Daily News: “She was always yelling at the kids, <<Shut the f*** up>>. The woman also said she heard more shouting on Sunday shortly before the girls were abandoned. “A kid was crying. She was saying, <<Stop crying, shut the f*** up. I’m gonna get you out of here>>,” she said. Other neighbors said the girls were always well dressed and clean but a resident of the housing project they lived at told the Daily News she would often shout and curse at them and pull on their arms. The older daughter, who said her name was Domini, told the Daily News her younger sister was called Dioni and they lived in a blue house with flowers in front of it on 53rd street, but she did not know which borough of New York it was. The girl also said her mother’s name was Dalisha and she drove a white car. The children showed no signs of physical abuse but were taken to Brookdale University Hospital for observation. Just after 10:00 p.m. on Sunday night, police arrived at Dalisha Adams’ house and opened the door with a crow bar, but she was not at home. Dalisha Adams was arrested after police matched the girls’ identity with photo records from Administration for Children’s Services, where the children are currently in custody. The mother was charged with two counts of endangering the welfare of a minor, police said. Police were alerted to the abandoned girls by an elderly couple who found them standing at a busy intersection with the diapers in their arms as cars zoomed by them. The children’s grandmother, Bertha Davia, said it was all a misunderstanding and is asking ACS to place them in her care. Bertha Davia, 52, told Eyewitness News that she lives in the complex next to where the children were left and the mother must have intended to leave her children in her care. The grandmother said she is furious her daughter never told her the children were coming and only realized what had happened when she saw their picture on the news. Although Bertha Davia is angry over the incident, she said she does not believe the two girls were abandoned on a street corner and it was just a big misunderstanding. Michelle Davis, 43, from Brooklyn, told the Daily News: “They were wandering up and down the sidewalk for a while, just playing by themselves. The police said both children were in good condition after being checked over in hospital and were now in the care of the ACS, who did not immediately respond to an inquiry.